Meet "Buzzy", the small truck with big possibilities. Unlike some small trucks or sprinters, this is a fully capable production truck featuring the same high quality and reliable equipment found in our larger mobiles. 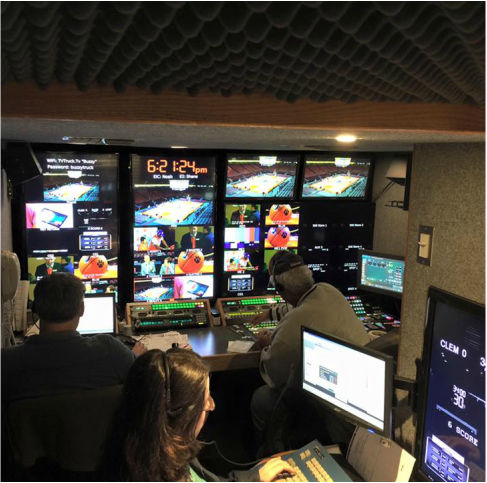 Featuring a Grass Valley K-Frame Switcher and EVS for replay and effects, production teams won't have to learn new systems or compromise on the quality of the show they are accustomed to. The full compliment of support gear, including studio lenses and cable, travels with the truck with no additional trailer or fuss. Last, but not least, Buzzy has a fully redundant 2.4m KU satellite uplink, making it a complete turnkey solution for a small production or in tandem with one of our other mobiles.